Mary Keziah and William Starkweather, whose ancestors had settled in Preston, Connecticut in the late Seventeenth Century, were the first European-origin persons to settle in what is now Plymouth. They purchased 240 acres from the federal government in March, 1825 and subsequently built a log cabin near what is now the intersection of Main Street and Ann Arbor Trail. Their second child, George Anson Starkweather, born in 1826, was the first white child delivered in Plymouth. At age 18, George Starkweather went to Ann Arbor to matriculate in the fourth entering class of that institution. However, he dropped out during his first year because his father died. Later, he went to New York to obtain training in the law and then returned to Plymouth. In 1865, he and a partner then established a general store. He subsequently became active in civic affairs, serving as township clerk in the 1880s and as village president in the 1890s. By 1850, Plymouth was connected to the outside world by a plank road. In the 1870s, the predecessors firms of the Pere Marquette Railroad began building a line from Detroit to Ludington, a line that connected Detroit to Lansing. George Starkweather encouraged the rail firm to lay down its tracks through Plymouth. Simultaneously, he promoted the idea of a new downtown for Plymouth located near where the home you see is located and where the Pere Marquette built their station. Apparently, some other residents of Plymouth in the 1870s strongly opposed a rail line that would traverse their area. Once the rail line linked Plymouth to Detroit, the plank road—a toll one—lost its business and may have gone under, literally and financially, in 1872. The area Starkweather developed is now known as “Old Village” or “Lowertown.” I suspect that this is a new name recently coined for this area by promoters. Starkweather was among the earlier advocates of a public school in Plymouth, and for decades, one of Plymouth’s schools carried his name. 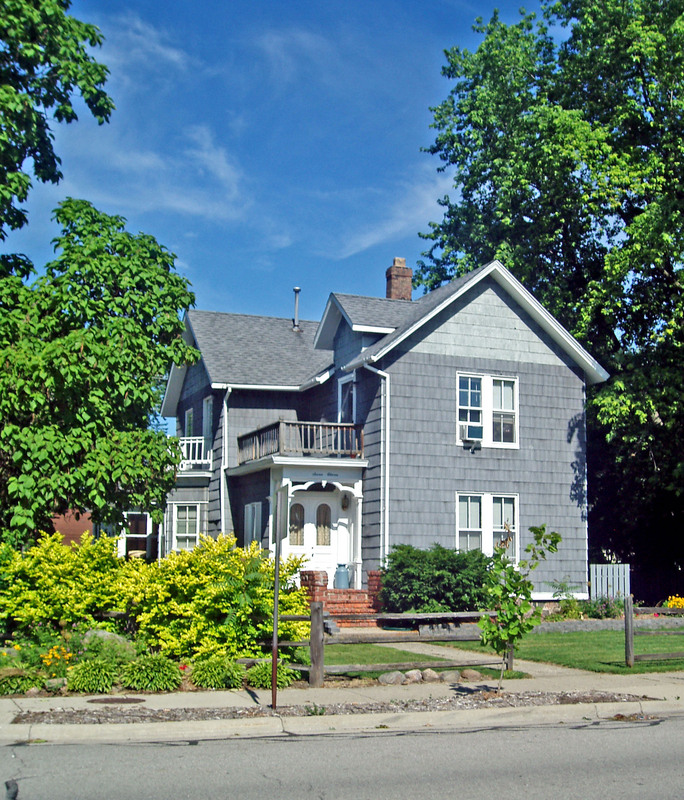 The home that you see is a rambling structure, constructed in 1875, that once included many Victorian features. Over the years, the traditional window trim and dormer features that you might expect in a Victorian home have been removed, likely because of the cost of their upkeep. You notice an enclosed vestibule where the entrance is located and a long wing that extends away from the front of this house that faces a street that bears the original owner’s name. The original siding was clapboard but it has been replaced by shingles.